A spatial planning process for fish farming and mussel farming was conducted in the region of Jämtland and in the region of Kalmar in Sweden. The purpose of the processes was to test a common road map/manual for localizing sustainable aquaculture farms in the Baltic Sea Region. The manual was created in a real case scenario where ten fish farming locations were pointed out in the region of Jämtland and twelve favourable blue mussel farming sites were pointed out in the region of Kalmar. What is a suitable process for identifying appropriate locations for aquaculture? The guidance was developed as part of the Aquabest project, which had a project goal to suggest a common roadmap for spatial planning or localizing sustainable aquaculture in the Baltic Sea Region. Although localization processes are needed for most types of activities there are, prior to Aquabest, very few examples in which aquaculture is included in regional or municipality spatial planning processes. To achieve the goal and purpose, Aquabest used already existing spatial planning tools to localize good aquaculture sites and detect physical, social and environmental obstacles for fish farms in hydropower dams in the Jämtland region and for Mussel farms in Kalmar region of Sweden. The Aquabest project has worked with localization of aquaculture farms on three different aspects: , geographical, environmental and social, with the main goal to create sustainable development. For the case studies the goal was to identify 10 suitable sites for aquaculture farms in each county, and incorporated these sites in the municipality planning processes. The purpose of processes was to suggest a common road map/manual for localizing sustainable aquaculture farms in the Baltic Sea Region. 2. Perform a GIS analysis: For the case studies, GIS tools were used to evaluate geographical data necessary for aquaculture business and find suitable areas for aquaculture farms. As pertains to mussel aquaculture, field tests were conducted to evaluate mussel settings in favourable areas pointed out in the GIS investigation. 3. Stakeholder consultations: In order to achieve social acceptance of aquaculture businesses, consultation processes were performed in the case study regions. With regards to MSP, the results of the Kalmar region case study for mussel farms in brackish water are most relevant. 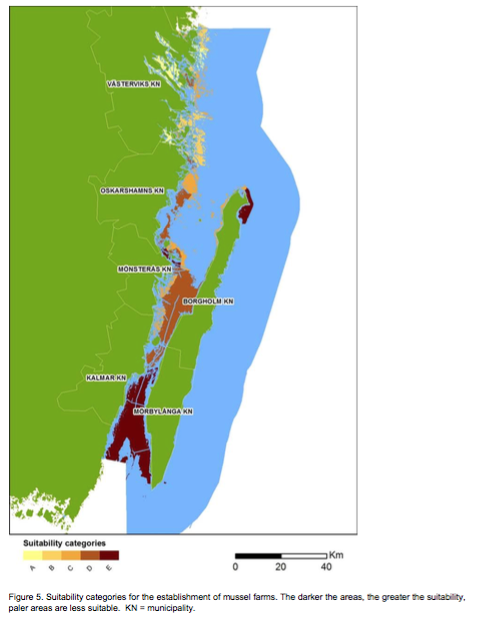 Suitability maps for establishment of mussel farms were produced from the GIS analysis, and 12 favorable mussel farming sites were identified. Following implementation of the suggested manual described above, the conclusions was reached that farming blue mussels for fish feed might be possible, but questions regarding production capacity and economic viability, among others, remain to be answered. The spatial planning process helped increase local knowledge of mussel farming. The GIS data that was used, the carrying capacity calculations or the stakeholder composition that were invited to the consultation process may not be the best for other regions in the BSR. But the input of data to the GIS can easily be changed and so can also the carrying capacity calculations and the stakeholder composition. 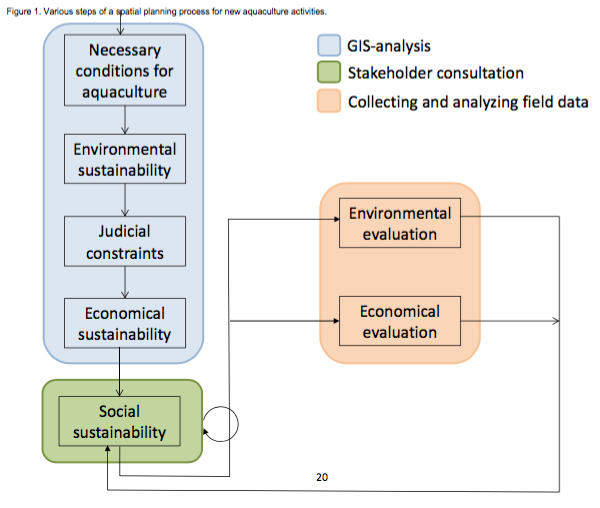 The steps suggested for such a planning process could also be followed in other aquaculture spatial planning processes in the context of MSP. Funding Source: Interreg 2007-2013 Baltic Sea Region. Costs for this specific report are unknown, as it was developed as part of the overall Aquabest project.